I've had this recipe in my files for ages, but haven't made it. This year, I thought I'd make it to send to my stepfather, who loves Jack Daniels. I had to tinker with the recipe to make it work, and I still don't think it's just right. Most glazed nuts recipes call for boiling the coating mixture before stirring in the nuts, and that might work better with this recipe. I can't say I loved them, but then again, I'm not a big drinker of Jack Daniels (which is why I used the teeny tiny bottle). 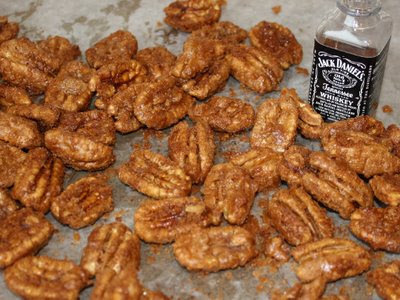 I post the recipe here in case you enjoy Jack Daniels, or want a quick goodie for someone who does. If you make them, please let me know what you think. In a large skillet, combine sugar, Jack Daniels, instant coffee and cinnamon. Mix until well combined. Stir in pecans. 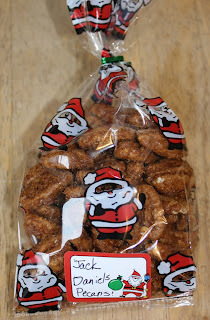 Bring to a boil over medium heat, stirring constantly until pecans are well coated. Put in oven and bake about 10 minutes, until the coating is dry. Cool. This is a great idea for a present - wish I'd seen it earlier. Must remember for next year! I'll let you know how they turn out, my husband and father in law are huge Jack Daniels fans, I think we keep them in business! Wowzer - these look really good! Too late for this year but bookmarked for next. This is a great idea. I wouldnt have thought of that. I made them, woohoo! I think they turned out good, but needed a little more Jack flavor. It tasted really good, but I think baking them took some of the Jack away. I did a post today on them. Thanks for sharing!! Yum. I'd be all over these.